Returning from space exploration in a far off galaxy, space cadets Jupiter and Mercury return to earth to find humanity decimated by plague. Surviving citizens are cold, suspicious, and hooked on banality. Our gods-in-disguise prowl about town looking for someplace to unveil their gender-bending extravaganza. No one will give these gods a chance but the down-trodden tavern of Philemon and Baucis. So tavern owners and old married couple Philemon and Baucis (Alejandro Magallon and Anna Hashizume) display their hospitality by welcoming the disguised gods, aka Zeus and Hermes (Isaac Bont and Maddie Neal), when no one else will. As a reward, their deceased bug children, the newly married Aret and Narcissa (Roland Hawkins II and Joni Griffith), are returned to them, which doesn't solve the larger problems that the earth is facing. The story is charmingly told by Ovid himself (Collin Woolson), as we travel through this quirky and at times poignant little tale. The large and diverse cast are all a joy to watch, so playful and present in this unconventional setting of the great outdoors. The music is lovely and fun, accompanied by a classic quartet of cello, violin, guitar, and accordion (music directed by Gary Ruschman). Costumes are fun and colorful in a makeshift sort of way, with clever props and signage to help with the translation (costume design by Anna Sutheim, set and prop design by Paul Herwig). 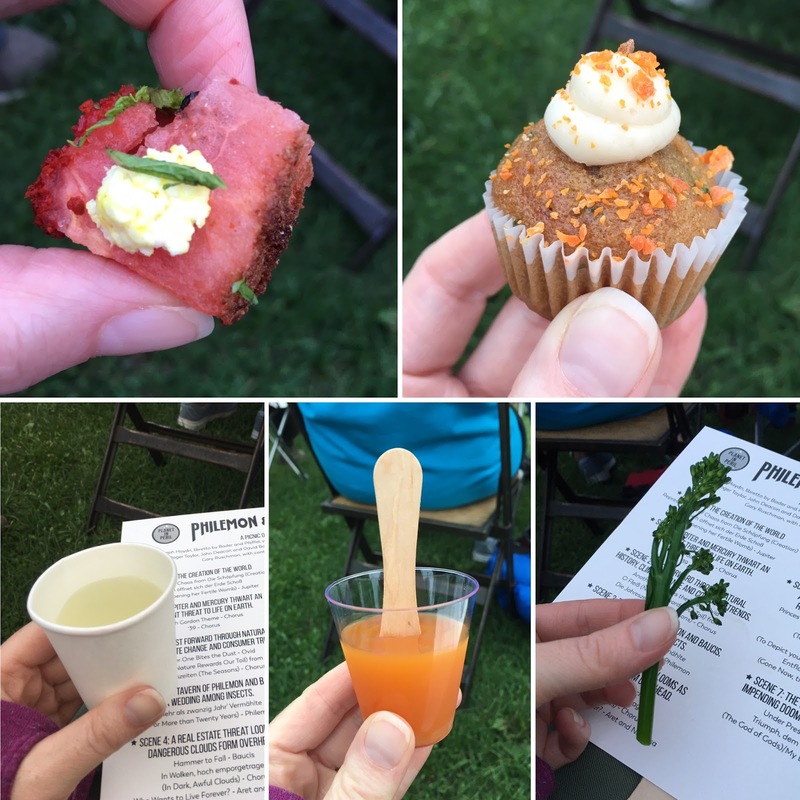 Throughout the show, small bites of delicious food (created by Chef Nick Schneider) are introduced into the story and passed through the crowd (all are vegetarian with ingredients listed, ask about special dietary concerns). Mixed Precipitation performs at parks and gardens around the metro area, and also ventures out of town for a few shows. I saw them at Dodge Nature Center in West St. Paul, whose mission is "to provide exceptional experiences with nature through environmental education." I didn't even know they existed! It was a positively idyllic setting to experience theater, music, fun, and food, with a barn as a backdrop, the clouded (but not precipitating) sky overhead, surrounded by green. 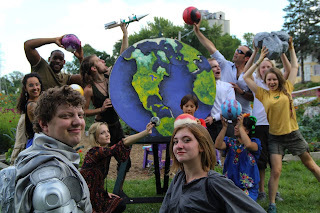 Philemon and Baucis: Planet in Peril will visit locations just as lovely as this in St. Paul, Minneapolis, Eagan, St. Louis Park, Hastings, Winona, and more in the next six weeks (full schedule and ticket reservations here). Don't miss this a delightful and unique experience of #TCTheater, delicious food, and nature!